Yep, right about now the next Nerd Bait – creators of The Treacherous Brain and The Wee Mermannie – happening is happening. Or about to happen. We all look forward to sharing it with you – stay tuned. APOPLECTIC.ME – TOMORROW: YESTERDAY’S NEWS, TODAY! Thanks, Joyce! You can find out more here, now. 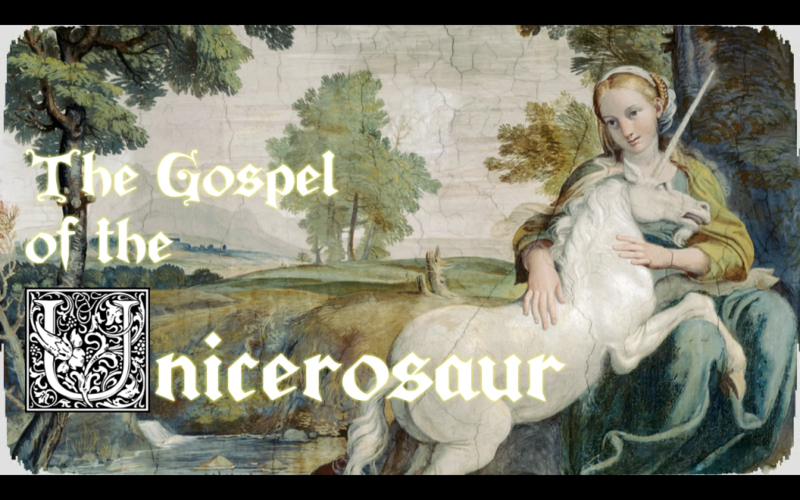 Funnily enough, given my comment on your recent post on religion in recovery, The Gospel of Unicerosaurus is chock full of Biblical references and exhortations to faith. Although in the end, the debunked dinosaurs in the longer show are saved by their belief in (I like to think “love for”) each other.